For nearly 25 years, Lexus LX models have offered an pleasingl balance of luxury, off-road capability and everyday usability. 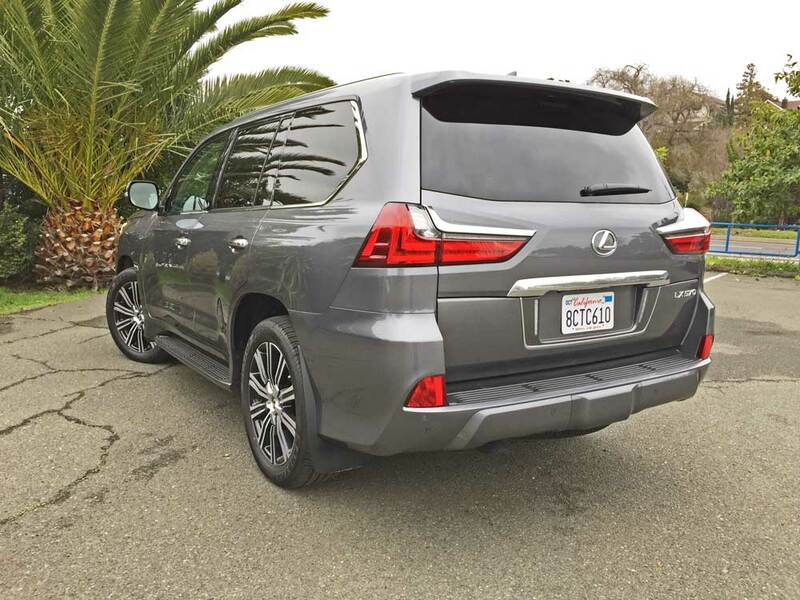 The Lexus LX was the first premium, full-capability prestige three-row luxury utility vehicle, and the 2019 Lexus LX 570, continues that heritage, but now also offers a two-row version, eliminating the cumbersome removal of a third row set for extra cargo space. Also new for 2019: optIonal outside puddle lamps now project the “Lexus” logo; a digital clock now appears in the Multi Information Display; and Lexus Reform Remote includes smart watch and Amazon Alexa skill integration. 21-inch wheels and a heated wood and leather steering wheel are options for the two-row model. Many luxury buyers find that an all-wheel drive crossover fits their needs, while those requiring true off-pavement driving capability and high towing capacity find those capabilities with seating for from 5 and up to eight in the Lexus LX 570. 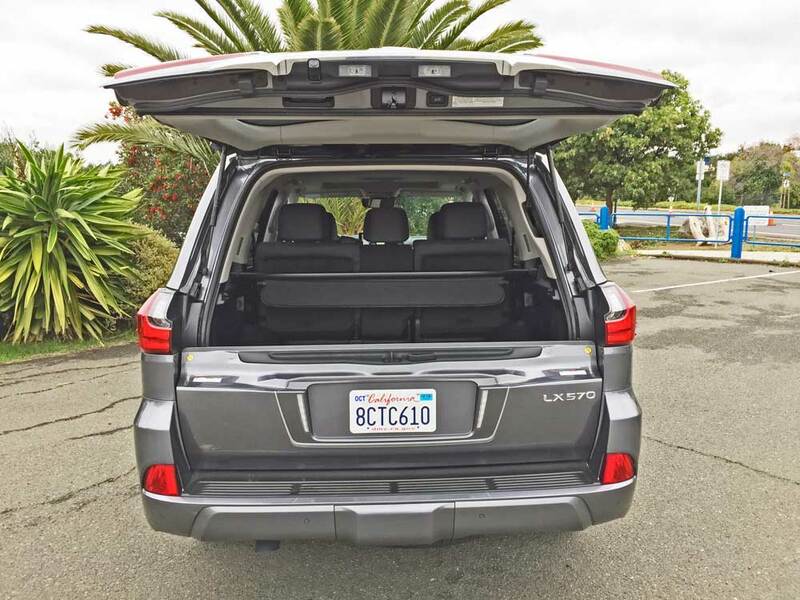 It’s a luxury SUV that can transport the entire family on an on or off-road adventure, including towing the camper along, with its standard 7,000-pound towing capacity thanks to its high-strength body-on-frame construction and more than ample power. Its 5.7-liter DOHC, 32-valve, dual VVT-I V8 engine with sequential Multi-port Fuel Injection that cranks out 383 horsepower at 5,600 rpm while also generating 403 pound feet of torque at 3,800 rpm. Energy from the healthy longitudinally mounted front engine V8 is geared to the standard full time four-wheel drive system through an electronically controlled sequential shift eight-speed automatic transmission. 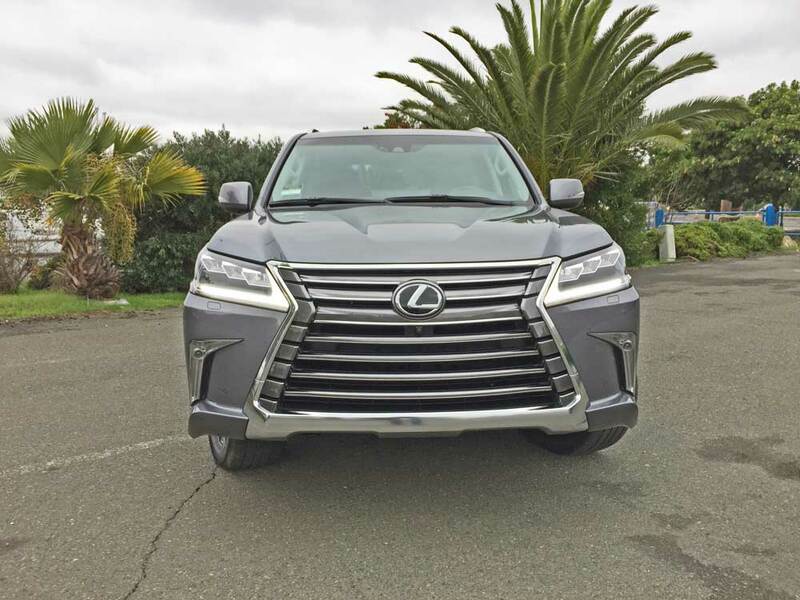 No matter how you refer to the 2019 Lexus LX 570 — as an SUV, SAV or LUV (Sport Utility Vehicle, Sport Activity Vehicle or Luxury Utility Vehicle respectively), it is truly a full capability vehicle – perhaps then we should call it an FCV? Okay, enough with the acronyms already. The Lexus LX 570 is positioned at the top of the marque’s utility oriented model lineup. The Lexus LX 570 full-time four-wheel drive system employs a Torsen® limited-slip locking center differential that splits the power 40:60 under normal driving conditions, with the rearward power bias contributing to on-road agility. A four-wheel Active Traction Control system works in conjunction with the 4WD system, helping to control wheel slip. The Multi-Terrain Select system allows the driver to select terrain type — Rock, Rock & Dirt, Mogul, Loose Rock, or Mud & Sand –optimizing the Active Traction Control. A driver-selectable low range for the transmission provides low-speed crawling capability for handling steep off-road declines. Shifting into low range also engages Active Height Control, which raises the vehicle increasing ground clearance by two inches. Low-range capability is further augmented by Crawl Control with Turn Assist and Hill-start Assist Control. Crawl Control manipulates the throttle and brake functions, helping to maintain a steady slow, even pace on steep declines or when maneuvering over rough, uneven or difficult surfaces. The Hill-start Assist Control prevents the LX 570 from rolling backward when moving from a stop on an incline. The LX 570’s Turn Assist feature aids in tightening the vehicle’s turning circle, applying brake force to the inside rear wheel while on trails. The Variable Gear Ratio Steering provides the LX 570 with optimal steering response in slow, rugged trail driving situations and also enhances directional control in highway driving. The LX 570’s Adaptive Variable Suspension continually adjusts shock absorber damping rates while on the move, ensuring a maximum comfort level even as the road surface changes. Selectable Comfort, Normal and Sport modes allow the driver to tailor both the system’s ride firmness and comfort. Adding to the comfort quotient, Lexus LX 570 comes equipped with such standard amenities as a driver’s 14-way power adjustable front seat, four-zone independent climate control, front power-seat cushion extenders, navigation system, a rear back-up camera, a power-sliding second-row seat and power-folding and retractable third-row seat. 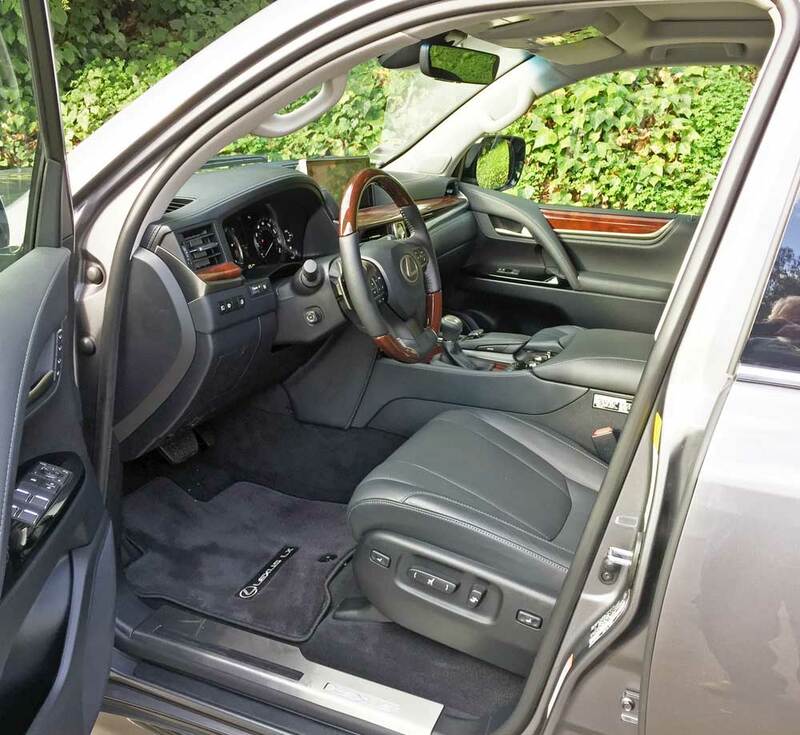 Even getting in and out of the vehicle is made easier by the Easy Access system, which when the ignition is turned off, automatically retracts the steering wheel and moves the driver’s seat rearward. Both return to their preset memory positions the next time the driver is seated and turns on the ignition. Active Height Control, which may be engaged for off-road travel, lowers the LX 570 by nearly two inches to assist when entering or exiting. Normal height resumes automatically when the vehicle begins to accelerate. 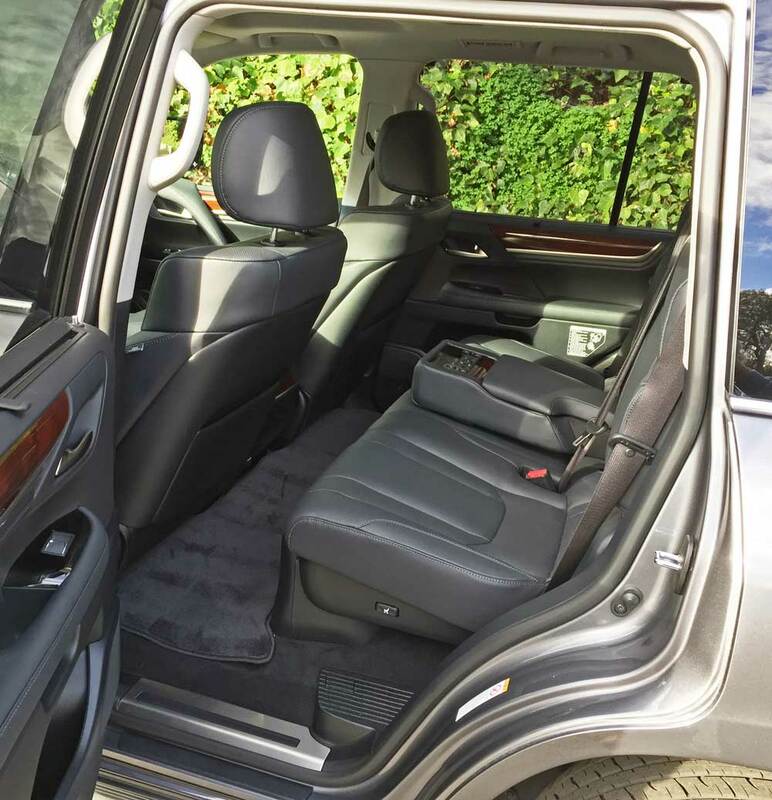 The Lexus LX 570 is extremely versatile, opening up a large useful cargo area. Seating is for five in the two row version, or opt for a three row model, and the 50/50 split power-retractable third row seat folds into the floor, providing 41 cu. ft. of carrying space, and expands to 83.1 cu. ft. with the 40/20/40 split middle row folded. The clamshell-design tailgate features a power upper section, that is much more functional than a traditional one-piece hatch. 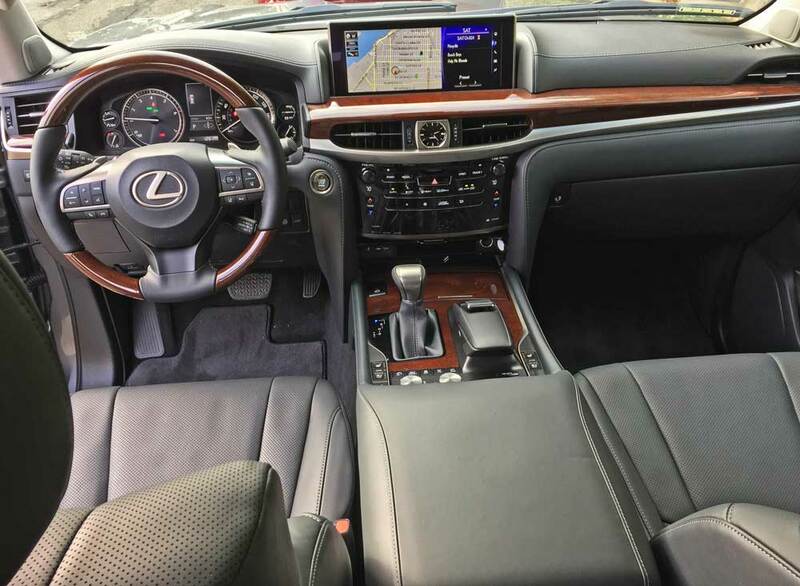 There are a host of safety touches integrated into the Lexus LX 570 including ABS and EBD, plenty of air bags and a rear backup camera with Navigation screen projection to name just a few. State-of-the-art multimedia abounds in the Lexus LX 570, offering something for all occupants. Lexus Enform® is capable of making a compatible Bluetooth® smartphone even smarter. Lexus Enform with Safety Connect® is available by subscription. 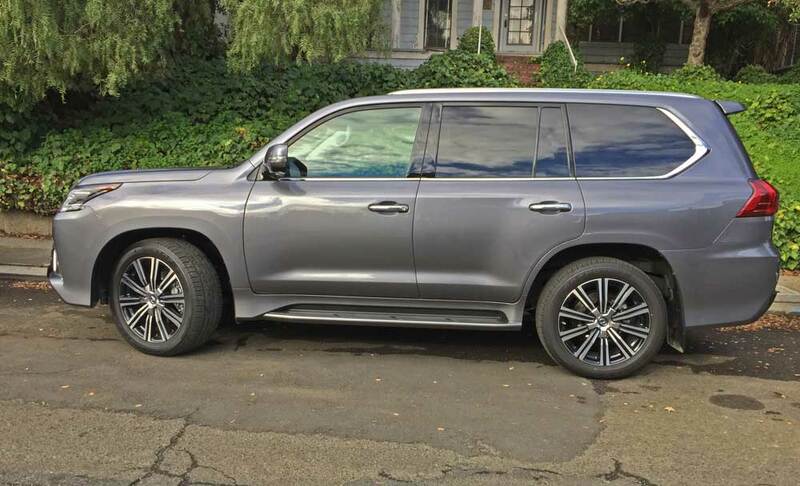 My test 2019 Lexus LX 570 5-door two row SUV, came with the exterior finished in a Nebula Gray Pearl metallic, with an Ebony Charcoal interior featuring polished Dark Brown Walnut trim accents. The base price was set at $85,830. While the final tally came to $87,915 after adding options and the Delivery, Processing and Handling fee. 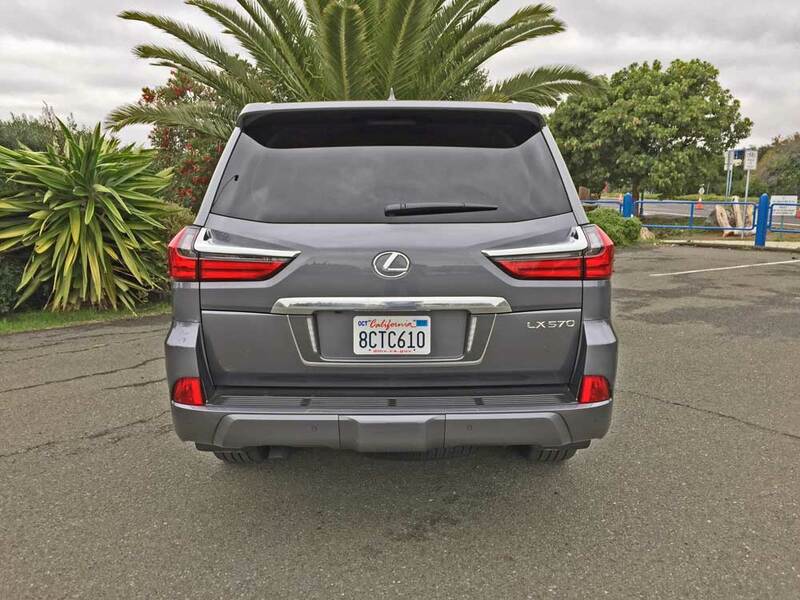 The Lexus LX 4570 is an exemplary mode of transportation for on or off-pavement exercises, albeit a tad thirsty with 13-mpg city and 18-mpg highway. It is attractive, as well, considering its three-ton mass. Acceleration is stellar, as are the smooth gear transitions from the transmission. The ride quality is both smooth and solid but never harsh, and handling characteristics reflect agility with minimal effort. 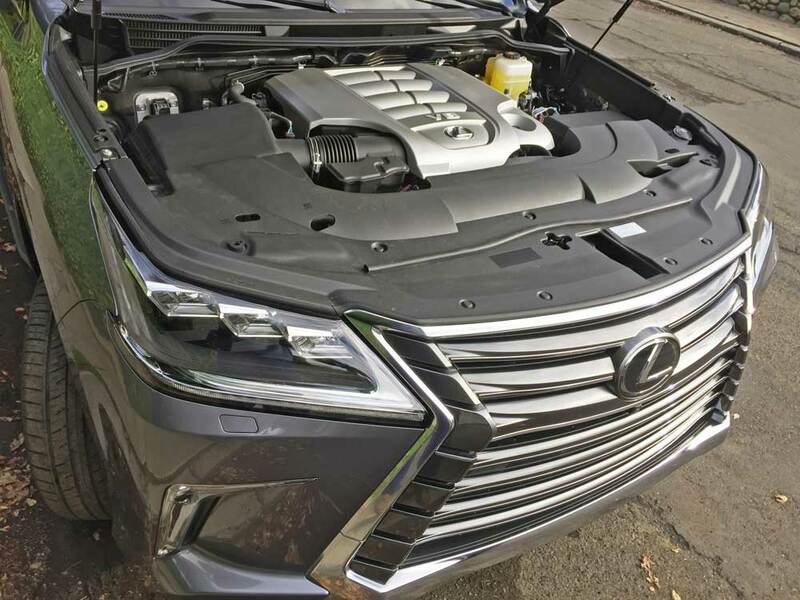 With the LX 570 comes the Lexus and Toyota reputation for quality and dependability, backed by a comprehensive limited warranty program. If you require extremely serious, hard-core off road maneuvering, you may want to keep looking, but the LX 570 delivers versatile and sumptuous interior appointments, sure-footedness on and off pavement, and an impressive level of technology. Basically, there’s limited competition at this level in a full size luxury SUV, and if you’re not looking to go rock crawling it fills the bill in spades, and actually costs less than a legendary and well-known British marque. Engine Type and Size: 5.7-liter DOHC, 32-valve, dual VVT-I V6 with sequential Multi-port Fuel Injection. Transmission: Electronically controlled sequential shift eight-speed automatic. Drive Train: Longitudinally mounted front engine / Full-time four wheel drive with Torsen limited slip center differential. Front – Coil spring-type double wishbone independent. Rear – Four-link coil spring lateral rod-type. Brakes: Power-assisted four wheel discs with Multi-terrain ABS, BA, EBD, VSC, Active Traction Control, Brake Assist, Electronic Brakeforce Distribution, Vehicle Stability Control, Hill-start Assist Control and Crawl Control with Turn Assist. Tires: Dunlop PT34 Grandtrek P275/50 R21 113V M&S mounted on 10-“double spoke”-spoke (alternating short/long) alloy wheels with Black and machined finish. 0 – 60 mph: 7.3 seconds. Top track speed=137 mph electronically limited.